Whangamata is famous for its unique combination of beach and unspoiled rainforest. The amazing ocean beach provides some of the best surfing breaks; yet swimming here is absolutely safe. The town has one of the better shopping centres in the area, a unique café culture and a range of sporting facilities from 9 & 18 hole golf courses to a fabulous swimming pool. The Coromandel Forest Park and Tairua Forest bordering the town of Whangamata provide great outdoor experiences including long and short walks, mountain bike trails and old gold mine sites. 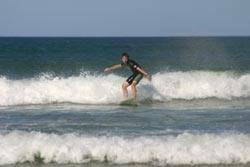 Or you can choose to go surfing, water-skiing, rock or game fishing, kayaking or tramping. It’s all to be found at a mere 15 minute drive from Pauanui and Pauanui Glade Holiday Park.